Many flower stylists, wedding planners, and tasteful brides love the beautiful Mini Spray Roses White because there are many uses for them. They can be employed easily in bouquets arrangements for a bride or that of bridesmaids. 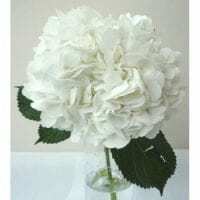 They are also great when used as fillers in wedding centerpieces and tabletop arrangements. Because each stem of the white spray rose has several delicate branches with each bearing a delicate white bloom. The Mini Spray Roses White are also ideal as wedding flowers for your upcoming nuptials. Their beautiful white color conveys a great sense of purity and romance to your guests and loved ones gathered for your wedding ceremony. You can weave them with greeneries such as the classy Silver Dollar Eucalyptus and Magnolia Greenery for impressive wreaths and garlands. You can decorate the bridal head tables, wedding gazebo, and altars with these garlands. Buying your greenery and fillers as bulk flowers are the smartest way to go for peace of mind. 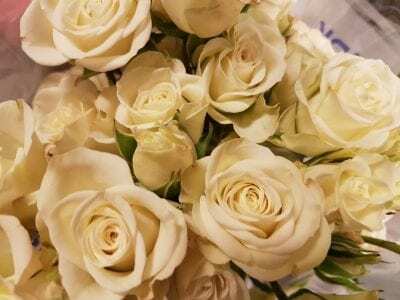 There are many flowers and fillers that will greatly complement the Mini Spray Roses White. You can use other colored roses such as red roses, pink ones, and peach roses one to create wonderful wedding flowers or other vase flower arrangements. Flowers such as dendrobium orchids, white hydrangea, and assorted colored calla lilies are also perfect matches. 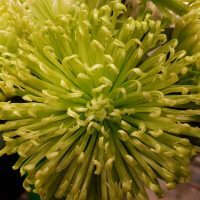 Make sure to get your supplies as bulk flowers for the best affordable prices for greenery and fillers such as Limonium flowers, Yellow Solidago and Baby’s Breath. 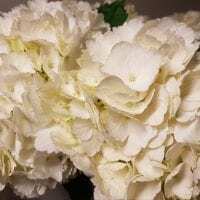 Call us at Toronto Bulk Flowers for the most competitive price quotes on wholesale flowers for your Mini Spray Roses White, as well as all your other fillers and greeneries. Buying them as bulk flowers will give you the versatility to style your DIY flower designs with great ease. We recommend that you receive your order 3 days prior to your event. Tend to be extremely fragile and easily destroyed during transportation. Roses come with guard petals so they might appear distorted and bruised on arrival. Might need to remove up to 8 petals for each bloom. Shipped in bud form. Once properly hydrated (up to 48 hrs. ), they will bloom into a larger size. Meaning of flower: love and passion. Flowers per stem: 1 bloom (about 3 inches wide) and unless stated on the website, 40 cm in length. Common colors: red, white, yellow, orange, pink and light purple. Dye Colors: blue and rainbow * Dye will transfer color to EVERYTHING. Please be careful when processing. Grower’s bundle includes 25 stems (might appear only 12 roses from the top, the bottom layer 13 roses). Guard petals: up to 8 petals. Average vase life: 8 days. 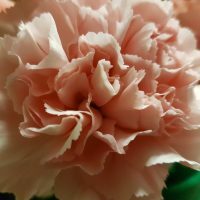 Per stem: 3-5 blooms (about 2 inches wide) and about 36 cm in length. Growers bundle includes 8-10 stems. Guard petals: up to 4 petals. Warning: A LOT of thorns (more than standard roses). We RECOMMEND wearing garden gloves while processing. Colors: comes in the same color as standard roses. Contact us for a specific color. Contact us well in advance. May need to import from other countries. May come in more than 1 bloom per stem depends on the varieties. We might require an original website (where you see the varieties) to send to our vendors to match the color. Per stem: 1 bloom, double or triple size of standard rose. NEED an exceptionally large amount of water and space to avoid overcrowding and damage. VERY delicate. Your order will be in the water when you receive it. When we receive our flowers, they come in boxes. We inspect all our flowers and make sure they are up to our standard. We cut all the stems and dip them in instant hydrating liquid before putting in water. We do not process any of your flowers (cutting any leaves or thorns of roses). We will take your flowers off from water right before they go out for delivery, you might find the delivery box little wet when you receive your flower. Make sure buckets/containers is clean, may wash with diluted dishwashing liquid or bleach, make sure raise well. Fill your buckets/containers with at least 6 inches of fresh water. We recommend using close to room temperature water or even slightly lukewarm water (Especially in winter). Add the provided flower food to the water, follow the instruction of the package. Adding TOO MUCH flower food will make flowers wilt faster. Remove all package and elastic bands. Cut all leaves below the waterline to prevent bacteria growing in water which might cause premature wilting. Cut the stems about 1 inch from the bottom at diagonally 45 angles to maximize water intake. Immediate after cutting put flowers into the prepared water. Make sure you are NOT over-crowded your bucket. Over-crowding may affect or damage the blooming flower. 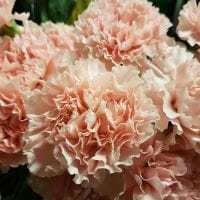 Re-check on flowers after 3-4 hours, if the flower is drooping, RECUT the stem another 1 inch, it is possible the air bubble is formed inside the stem which blocking the water intake. For ANY foliage, put them in FRESH water ONLY. Flower food will make foliage wilt faster. Keep both flowers and foliage in cool (prefer darker) location. Please avoid any direct sunlight, wind drafts or heat and extreme temperatures. 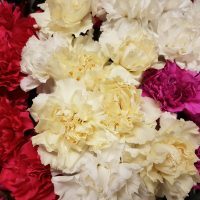 Putting flowers in warm temperature will help flowers (especially roses and carnations) blooms quicker. Vice versa, putting flowers in cooler location will slow down the process. Change water every 48 hours or when the water becomes cloudy. Make sure your flowers will have sufficient water at ALL times. All roses are with guard petals attached, in order to protect during transportation. After removing the packaging cardboard, carefully remove any brown or discolored guard petals. This might up to 8 petals per rose. Wear gardening gloves while handling since we do not remove any thorns on your roses before delivery. Your hydrangea will arrive in buckets, NO need to recut after receiving. Just leave them in cooler temperature. When re-cutting hydrangea, cut the bottom diagonally AND cut UP the stem vertically. Hydrangea will drink an exceptionally large amount of water, please DO NOT over-crowded your buckets/ containers. Your dye flowers will transfer its color to ANYTHING, please be careful when processing. It is normal that the water will be slightly tinted and just change to freshwater.